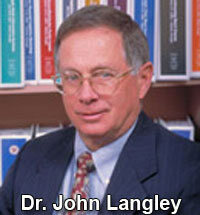 Dr. John Langley of Penn State Leads Research Once Again; Is the Dreaded 3PL IT Gap Finally Closing? For the 22nd consecutive year, Dr. John Langley of Penn State University has led the annual Third Party Logistics Study, released again this year at the CSCMP conference in Atlanta last week, a collaboration between Langley, again this year Penske Logistics, and new sponsors recruiting firm Korn Ferry and consultant Infosys, basically replacing Capgemini, which was a sponsor for many years. The report is based in part on survey responses from almost 600 shippers and 3PLs each worldwide, though the respondents are tilted heavily towards North America (68% of respondents), followed by Europe (17%) and Asia (9%). For years the IT Gap has been shrinking - but for reasons that are unclear, spiked back up in this year's data. The focus on the actual survey data is a bit muted in this year's report, with the spotlight being more on dicussions of a number of issues and trends, including use of blockchain in the supply chain, automation and digitation, managing risk in shipper-3PL relationships, and growing supply chain talent issues and challenges. This year's report comes in at a hefty 54 pages, and frankly from SCDigest's point of view the text could have been pared down a bit. The full report is theoretically available for free download here, but SCDigest had trouble getting the email conformation function to work. Regardless, we will summarize highlights from the report from this week and next for those not wanting to wade through the full document. of sales revenues has increased, reaching 11% in the current year's study from 10% in the previous year. That is interesting, given CSCMP's annual State of Logistics report found US logistics costs as a percent of GDP fell rather sharply in 2016, so we are not sure how to reconcile those different numbers. Over the same time frames, the percentage of shippers' transportation spend managed by 3PLs increased to 55% from 53%, while the percentage of shippers' warehousing spend managed by 3PLs decreased slightly to 39% from 40%, statistically unchanged. In discussing overall supply chain trends, the report makes the interesting observation that not long ago, "shopping" meant a consumer went to a physcial store to buy something. Now, shopping is a 24 x 7 activity wherever the consumer is, driven of course by mobile, with a resulting huge impact on supply chain and fulfillment. The report summarizes data from Armstrong & Associates on global 3PL revenues, which of course are driven directly by shipper spend with 3PLs. From 2010-16 - notably after the Great Recession - global 3PL revenues have grown a modest 2.8% annually, and SCDigest notes that is below global GDP growth over the period. But in North America, that annual growth rate is a more robust 3.8%, well above GDP growth of around 2%. • 61% of shippers indicate they are increasing their use of outsourced logistics services this year, up from 58% last year. Conversely, 28% of shippers indicate they are returning to insourcing many of their logistics activities, which is higher than the 26% reported last year but still lower than the 35% reported two years ago. • 53% of 3PL users report reducing or consolidating the number of 3PLs they use, compared to the 47% reported in the 2017 study as well as the 57% reported in the 2016 study. The three year trend thus indicates pretty strong interest in consolidatation. • 92% of shippers report their relationships with 3PLs generally have been successful, about flat with last year. • 73% of 3PL users say that 3PLs provide new and innovative ways to improve logistics effectiveness, versus a higher 92% of 3PL which believe they are providing that value. a strategic partner. In addition, 74% of shippers indicate they have formal plans to manage 3PL relationships but only 42% of 3PLs say formal plans to manage relationships exist. This data is conistent with results in prevous studies. SCDigest is always interested in the dreaded "IT Gap," which the report has been following for many years. That gap refers to the percentage difference between how shippers place 3PL IT capabilities in terms importance (always very high, usually in the low 90s in terms of percentage), versus their view of actual 3PL IT capabilities, always much lower a score. seeking enhanced analytical capabilities to help drive more effective supply chain decisions." Next week, we will look at some of the data and commentary in the report's special focus topics, which include as noted above use of blockchain, digitizaiton and more. Any reaction to the data summary of this year's 3PL study? Is the "IT Gap" closing or not - and why? Let us know your thoughts at the Feedback section below.